Good Condition - This product will show moderate signs of wear and tear. We have tested this item and can confirm that it is in full working order. This item has been restored back to its factory settings. Unlocked phones work with all UK and European networks. Please choose your required network carrier from the options above. If a manufacturing fault occurs within 12 months, we will repair or replace your phone, free of charge. If we cannot do this, we will refund your purchase. The warranty does not cover liquid or accidental damage. The battery is not covered under the warranty. It is a consumable part and may need replacing from time to time. Purchased one of these with the recent 20% voucher deal. Handset was in good condition, with only minor blemishes to the screen and body. However, battery on it was sadly useless. Battery drain was almost 2% per minute and it would switch off at anywhere from 50-65% remaining battery. XS have accepted the (free) return and so hoping for a better replacement. Voted hot as I have been very happy with seller and it is a good price for a very capable phone. Purchased one of these with the recent 20% voucher deal. Handset was in …Purchased one of these with the recent 20% voucher deal. Handset was in good condition, with only minor blemishes to the screen and body. However, battery on it was sadly useless. Battery drain was almost 2% per minute and it would switch off at anywhere from 50-65% remaining battery. XS have accepted the (free) return and so hoping for a better replacement. Voted hot as I have been very happy with seller and it is a good price for a very capable phone. Also got one from them recently. Like jmdarcy said, phone was excellent, but battery life was absolutely atrocious - less than 1h SOT. Was returned immediately. Most original Pixels in the wild are touching 3 years old now, so factor in the cost of a battery replacement before you buy one. Excellent phone for the money otherwise, runs Pie like a champ and the camera puts most 2019 midrangers to shame. Message seems to be that conditioning is often merely cosmetic. Phone was launched in 2016 - No doubt most have worn out batteries. After the first 2 years you’ll lose at least 15-20% of the battery. I charge my S9 daily. Also got one from them recently. Like jmdarcy said, phone was excellent, …Also got one from them recently. Like jmdarcy said, phone was excellent, but battery life was absolutely atrocious - less than 1h SOT. Was returned immediately. Most original Pixels in the wild are touching 3 years old now, so factor in the cost of a battery replacement before you buy one. Excellent phone for the money otherwise, runs Pie like a champ and the camera puts most 2019 midrangers to shame. How much should I factor in for replacement of a Non-removable Li-Ion battery? I'm thinking of buying my first phone wth Non-removable Li-Ion battery! Must tick boxes for me were card slot and removable battery, but both are disappearing. Showing £94.99 now so must have gone down a bit, plus they've got a silver one as well, I'm with you on this one must resist it'll only end in the hassle of trying to send it back when it turns up with a sh**ged battery ! If anyone wants to try the pixel experience on a budget, I quite fancy it as apparently you can get the official beta version of Android Q on them, I see Argos eBay still have a few silver xl's for 160 quid which hopefully will be near enough new. Showing a tenner off at £84.99 for me! How much should I factor in for replacement of a Non-removable Li-Ion …How much should I factor in for replacement of a Non-removable Li-Ion battery?Local phone repair shop?I'm thinking of buying my first phone wth Non-removable Li-Ion battery!Must tick boxes for me were card slot and removable battery, but both are disappearing. Thank you. Just done a quick Google search and it looks like £50-60 for a battery replacement, also plenty of YouTube videos if you fancy DIY but it's not an easy job by the looks of it. That's for "reasonable" condition, I'm sure someone on here will enlighten us as to what that's going to be like ! That's for "reasonable" condition, I'm sure someone on here will enlighten …That's for "reasonable" condition, I'm sure someone on here will enlighten us as to what that's going to be like ! All I've done is expose my ignorance/naivety regarding things ebay. I should go back to sleep. All I've done is expose my ignorance/naivety regarding things ebay. I …All I've done is expose my ignorance/naivety regarding things ebay. I should go back to sleep. I bought one of these from this seller recently and the fingerprint scanner was not working. Now awaiting a replacement. "Google's Pixel phone ships with 32GB storage options, which actually leaves you with 23GB of storage you can make use of. Google also offers a 128GB version of the device for those looking for added storage. You won't be able to add a micro-SD card to the Pixel"
By today's standards this is not a deal it's what the phone is worth imo. I'd give it a go for the camera if it had expanded storage but it doesn't and after apps there would be literally no room for pictures. That and the chances of the battery being rubbish I really don't know why you wouldn't just spend an extra few quid and get a brand new xaoimi or something. Phone was launched in 2016 - No doubt most have worn out batteries. After …Phone was launched in 2016 - No doubt most have worn out batteries. After the first 2 years you’ll lose at least 15-20% of the battery. I charge my S9 daily. 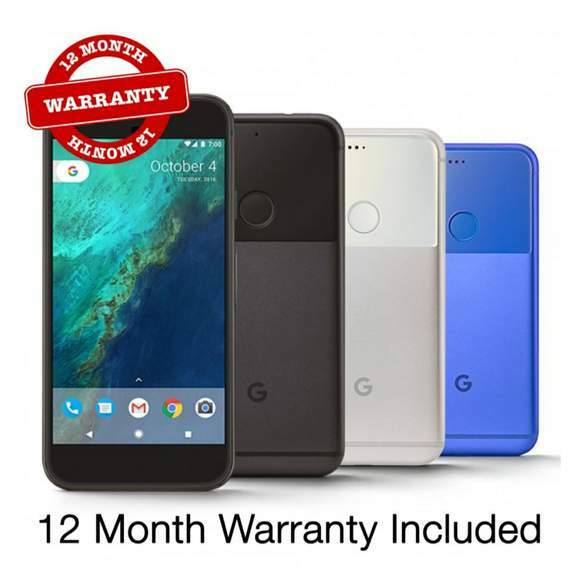 "Google's Pixel phone ships with 32GB storage options, which actually …"Google's Pixel phone ships with 32GB storage options, which actually leaves you with 23GB of storage you can make use of. Google also offers a 128GB version of the device for those looking for added storage. You won't be able to add a micro-SD card to the Pixel"By today's standards this is not a deal it's what the phone is worth imo. I'd give it a go for the camera if it had expanded storage but it doesn't and after apps there would be literally no room for pictures. That and the chances of the battery being rubbish I really don't know why you wouldn't just spend an extra few quid and get a brand new xaoimi or something. You do get full resolution back up of all your photos which does help. You can also take advantage of uploading your music to Google play music and stream/download as needed. This is key. With some easy tweaks you can turn this into an unlimited cloud store for photos and video on Google. I'm typing on one of these now (bought from another seller). It still runs really nicely. I've had no space issues with 32GB - I use the free unlimited Google photos storage and then let the phone remove photos and videos to free up space. I don't have any big games etc. though - if I did, I'd likely need more space. The battery on my one won't last a whole day of heavy use, and I'd imagine that will be the case for most of these by now. For this price, though, the phone is really slick to use and the camera is great. I'll likely not upgrade mine till it breaks. It is a good way to get cheap mobile phone with Snapdragon 821 processor. I guess beside the battery replacement you need to factor in another little purchase which is the power supply (Please note that the power adapter and USB Lead are not included). I guess you can't use a random USB power supply to take advantage of the fast charging. It is a good way to get cheap mobile phone with Snapdragon 821 processor. …It is a good way to get cheap mobile phone with Snapdragon 821 processor. I guess beside the battery replacement you need to factor in another little purchase which is the power supply (Please note that the power adapter and USB Lead are not included). I guess you can't use a random USB power supply to take advantage of the fast charging. I got one for my wife's Pixel XL from here, was a bit cheaper when I got it but it's genuine and fast charging works a treat. I got one for my wife's Pixel XL from here, was a bit cheaper when I got …I got one for my wife's Pixel XL from here, was a bit cheaper when I got it but it's genuine and fast charging works a treat. Thank you very much for the link. I'm going to buy the Pixel for my mom very soon. Did you buy the phone from this eBay seller? If YES what was the battery like? Did you have to change it? I'm thinking about doing it myself but a bit afraid about cracking the screen. Thank you very much for the link. I'm going to buy the Pixel for my mom …Thank you very much for the link. I'm going to buy the Pixel for my mom very soon. Did you buy the phone from this eBay seller? If YES what was the battery like? Did you have to change it? I'm thinking about doing it myself but a bit afraid about cracking the screen. No I got the Pixel from Laptops direct. I actually ordered 3 (2 grade B's and 1 grade C) and ended up keeping the Grade B with the best battery. I think I got lucky with it because it's normally about 5.5 - 6 hours SOT which is pretty decent. Personally, factoring in £60 for a screen change I wouldn't bother buying one unless the battery's decent from the off. As someone else said, getting another phone for ~£160 new might work out better but that's really your choice. I looked into doing it DIY but after a bad experience the last time I tried to do something I thought I wouldn't bother (plus as I say the one I kept was decent).